The new Arsenal 18/19 ftblNxt training shirt will be worn by the players during pitch warm-ups before European cup matches. The shirt is offered in navy with a diamond cut design running through the fabric and pink trim details. 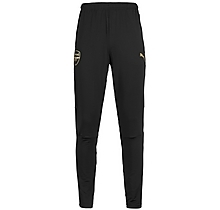 The premium design features include a raised silicone Arsenal crest and Puma logo and a band across the back that when stretched reveals AFC lettering in pink. The shirt also features Pumas' effective dryCELL technology helping to keep you dry during exercise.